It’s that time of year again. Where the National Archives are prised open to reveal thirty year old secrets, and we look upon events with fresh eyes, marveling at how close our leaders took us to Armageddon and yet empathising more with them as the full scale of their dilemmas become clear. This year, 1984’s secrets came tumbling out. So what have we discovered about the year George Orwell immortalised? No surprise that Mrs Thatcher barely lifted a finger in pursuit of Nelson Mandela’s release, though she did at least tell PW Botha that it was "totally unacceptable" for political rights to depend on the colour of a person's skin and refused to close down the ANC office in London. More intriguing is the build up to the murder of PC Yvonne Fletcher. Before she was shot dead by gunfire coming from within the Libyan embassy, it seems that Libya had issued a series of warnings. With the West supporting anti-Gaddafi dissidents, the Colonel was becoming increasingly antagonised and bitter toward the British government and warned that if support for his enemies did not cease, he would take up support for the IRA. Furthermore, if a specific anti Gaddafi protest went ahead “The Libyan government would not be responsible for the consequences”. The next day, that protest was fired upon and PC Fletcher died. 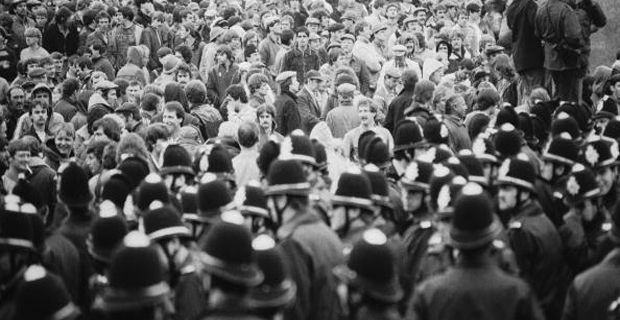 But of course 1984 was a seminal year in modern British history – the year of the miner’s strike. It seems that Mrs Thatcher was contemplating scenarios not far off Armageddon and was laying plans to call in the army for fear that Britain was going to run out of food and grind to a halt. One's mind can but boggle at the thought of such a divisive conflict escalating into the military sphere - both practically and symbolically. The papers offer insight into government fears of defeat in the strike, the spectre of another 3 day week, and the role of the ‘Blue Pimpernel’, David Hart whose shadowy ‘counter insurgency’ work was agreed to be ‘infinitely deniable'. With tales of union leaders entering the country with suitcases stuffed with Russian millions, Mikhail Gorbachev turning up unannounced at Downing Street only to be turned away, French secret agents planting bombs in London to ‘test security’ and senior minister John Biffen describing cabinet meetings under the Iron Lady as “miserably disappointing” gatherings devoid of debate and filled with “unctuous self-satisfaction”, it was perhaps a vintage year.